Well, since we talked about "the towers" yesterday, I suppose I could make it a two-fer. Last month - was it only a month or so ago? 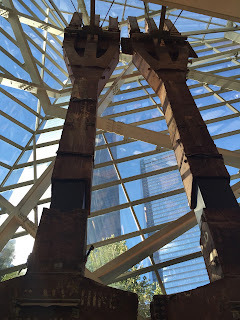 - when we were in NYC, we took the time to go to the 9/11 Museum. We had been to the Memorial back in 2014, but the Museum was not yet open. A month after our visit, and I am still not sure how I feel about the experience. The museum is still new(er), so the lines are like amusement park long to get in. We got tickets electronically, which is fine for purchase, but good luck getting their wifi to connect to bring them up when needed. We were taken out that line, to another LONG line only to have someone print them out manually. You'd think that being a museum of such a tragedy that the line workers would be.....oh, I don't know....not scowl-y, short and rude...........but they were all of those things. Getting in wasn't horribly welcoming. I suppose I sound callous if I don't say it was sorrowful.........but it wasn't. I get that we are desensitized to some of this. I get that 374 9/11 specials that run on cable from August 1 to September 12 every single year since 2002 has told the story 4,862 times. I've seen a number of the artifacts in one form or another over the last decade and a half. I have heard the phone calls from loved ones and flight crews. But now I get to pay $24 to see it.......again. But close up. Don't get me wrong, some things are just striking. Compelling, even. Some, well, there are only so many damaged emergency vehicles or parts of the antenna one wants to see. Of course, I'm speaking for myself. I like the above tridents. I liked the intact slurry wall. 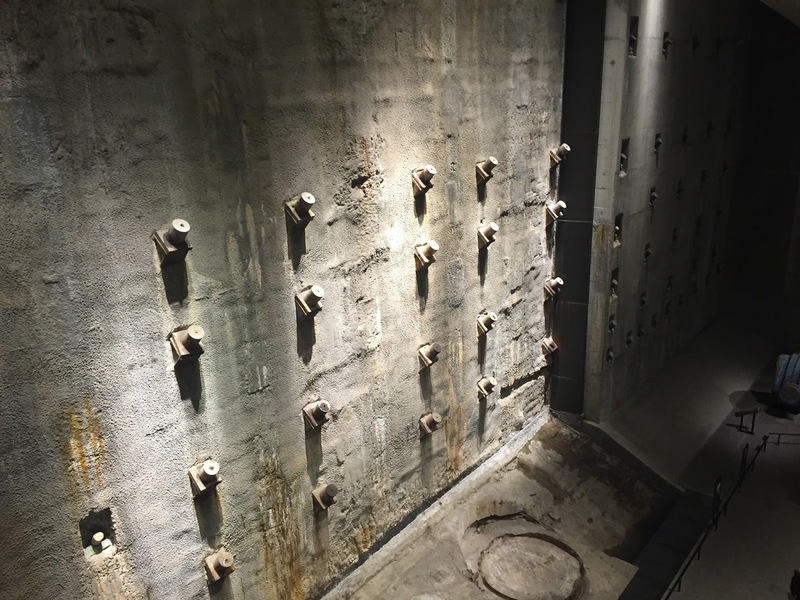 It was not all intact, so they ended up building a simulation next to it to continue the entire wall. That I didn't like. I found the Survivor Stairs to be great. 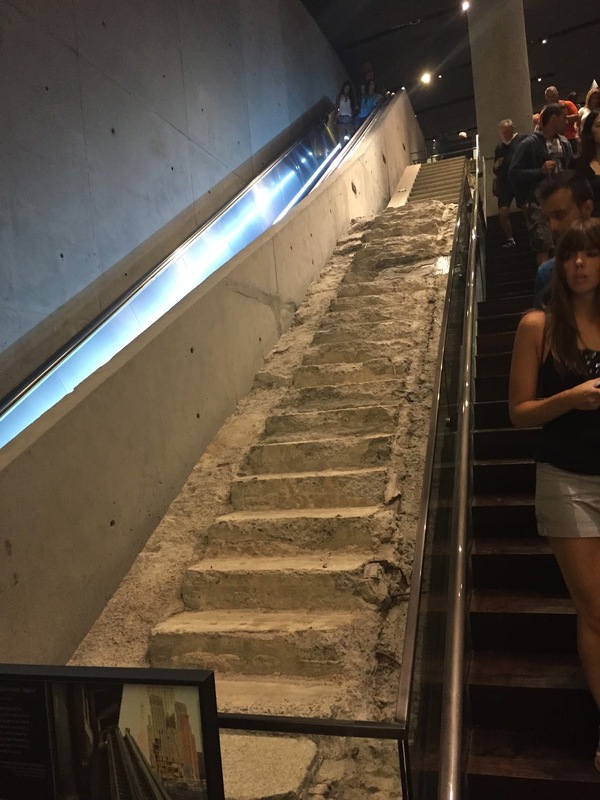 After the North Tower collapsed they remained pretty much intact allowing people to escape. Oddly the damage to them was not from the tower collapse, but from the cleaning and moving them. Crews were ready to destroy them while clearing the site. Preservationists had to fight to not have them demolished. It is hard to see, but each of those squares were the supports for the building. A building. I think my biggest take away was that you walked around the parameter of each of the towers and the bases of the above fountains came a few stories down, just as the towers had. Spencer Finch's "Trying to Remember the Color of the Sky on that September Morning"
9/11 had a crystal blue sky. Not a cloud in it - though I'm sure you're all visualizing that morning, and the film clips you saw as, or before, the planes struck. There are 2,983 panels. One for each of the victims - including 1993. Finch has the only commissioned artwork on site. And I think it was spectacular. Oddly, we missed one wall - and I'm not sure how, but it had images of each and every victim. I'm sure that could have made things more sorrowful. I'm not sure if I'm glad we missed that part at all. As it was, we were inside the museum for over two hours and moving at a good clip. And as it turns out we didn't see everything. Yet it doesn't seem like we missed out on much. One could easily spend many many more hours there - if they so desired. I kept a look out for all the EXIT signs. 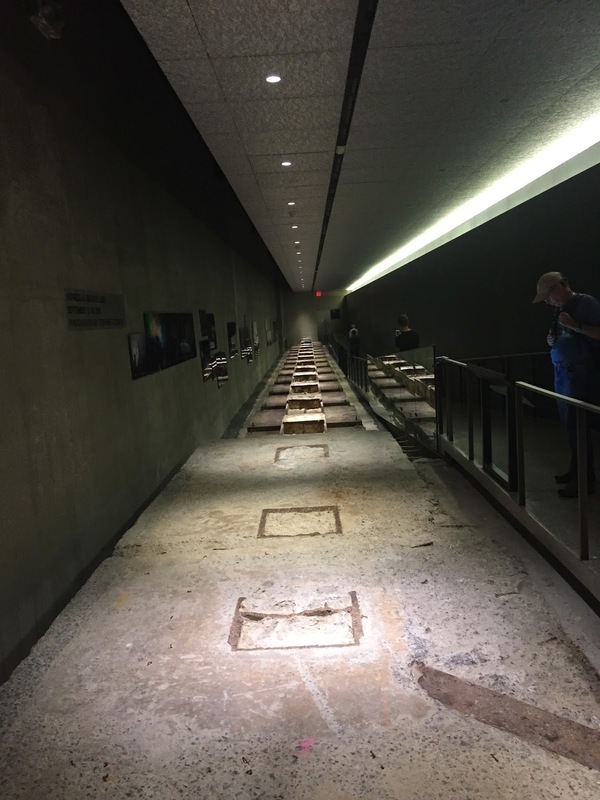 The designers built in easily accessible ones for people who would be too distraught at the exhibits and had to make a hasty retreat. I saw the exits, but never saw a person who even remotely needed to use them. I suppose I'm glad we did this, but I don't see the need to ever return. Once in a lifetime was enough. ...and I'm sure there will be 23 new specials on TV regarding the museum next August. I plan on visiting on our next trip to New York, but know that I'll visit just once. Surprisingly, we were at the memorial about a month ago, as well. I was awed by how it was present, from the quiet space with pieces of the towers on display to the abruptness of the noise as we entered the rooms filled with videos, bits and pieces of debris, articles of clothing, and other items from the aftermath. It was almost too much to take in. I was at the site just about Thanksgiving that year. Parts of the bases of the towers were still sticking out of mounds of rubble that still occupied the site. The area was fenced off but mostly visible. Surrounding buildings were still in ruins and vacant. The fences were covered with memorials and dust still filled the air. Everyone walking around, there were not many, viewing the site were silent. The streets of New York were solemn and each firehouse was a memorial in itself. The city was just beginning to bring itself back to life. The Christmas tree was lighted in Rockerfeller Center that week, which I believe was actually a catalyst in the revival of a sense of normalcy. I'm not sure I will go to the museum. I want to remember the feeling that surrounded the rubble as it was. I was deeply moved by it.